Millennium Project published its yearly report ‘2011 State of the Future’ presenting the overview of the prospects of the world development. Professor Pavle Sicherl as a member of the Millennium Project South East Europe Node contributed in the Appendix State of the Future Index the section on Time Distance Method. It contains history of the method, its description, how it is calculated, the strengths and weaknesses as well as frontiers of the method. Empirical examples contain analysis of the Human Development Index, life expectancy in the very human development group and compressed presentation of analysis and projections over 100 years (1950-2050) for elderly population for OECD countries. The strength of the S-time-distance concept lies in the fact that it enables additional exploitation of data and an alternate means of visualization of time related databases and indicator systems. Level-time matrix provides (with some interpolation) a visual impression of both levels of the indicator and the number of steps the indicator has experienced over time. Each selected level of an indicator is related also to the time when it was achieved and two generic statistical measures, S-time-distance and S-time-step, can be calculated from such time matrix. Time distance and time step bring new semantics to policy debates and management decisions. 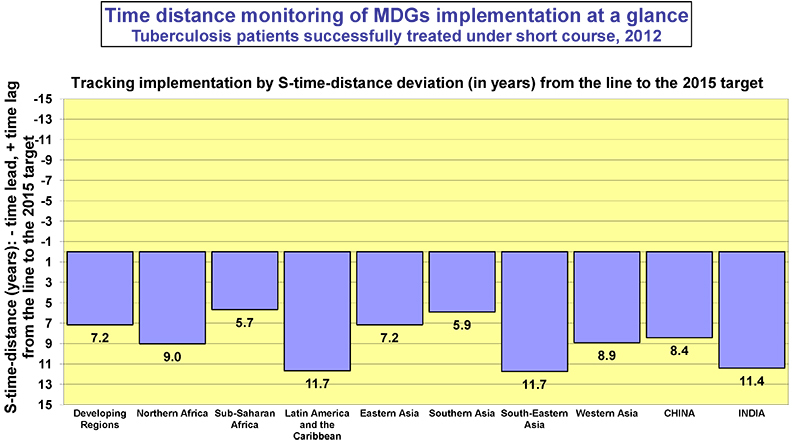 Time distance monitoring differences between actual and expected developments. The analysis techniques described are not forecasting tools in themselves but provide a means of presentation of complex data sets that have universal appeal, are intuitively understandable and can be usefully applied to a wide variety of substantive fields at macro and micro levels. They are a new way of presenting and analysing indicators complementing and not replacing existing methods.